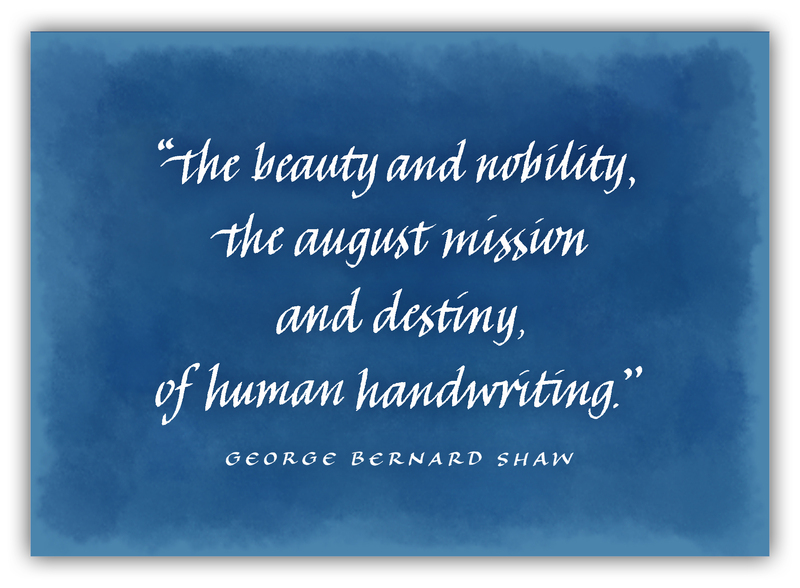 My recent post, The demise of handwriting in schools, prompted a comment from Clare, a former calligraphy student of mine. In her comment, Clare wrote at length in support of handwriting. In particular, she shared a story about how moved she was when, many years after her father passed away, she rediscovered a hand-written letter that she had received from him years before. She explained that on re-reading her father’s letter, his handwriting made her feel very close to him. Beautifully written, and very moving. And I know exactly how Clare felt, because a few years ago I had an almost identical experience. A few months after my elderly mother passed away, I was leafing through some old photograph albums of hers. Hidden between two pages, like a long-forgotten bookmark, was a creased and faded white envelope, inside which was a folded piece of ruled notebook paper. On opening the paper I discovered a short handwritten poem, and instantly recognised the handwriting as my mother’s. 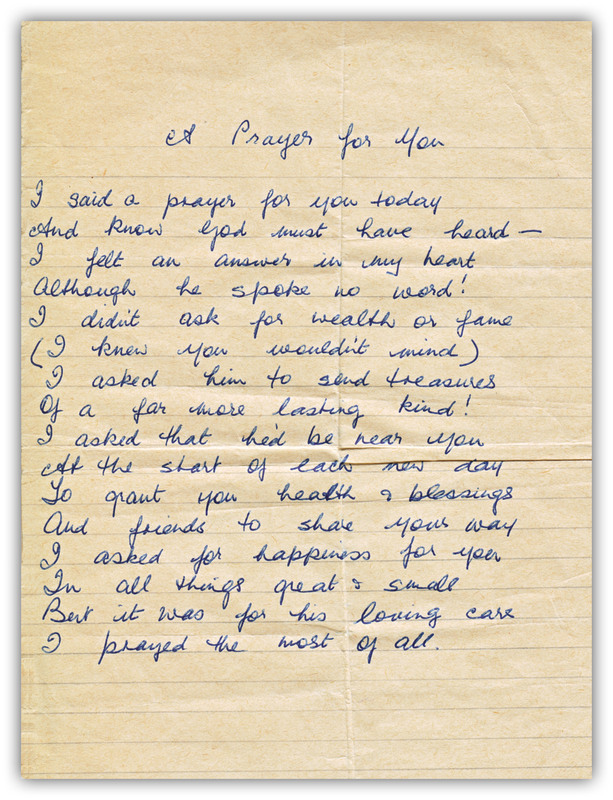 I was overjoyed, because that poem is the only surviving example of her handwriting. As my eyes traced her neat lines of script, I experienced a strange sensation that is difficult to describe… a heightened sense of my mother, almost as if I could reach out and touch her. I wasn’t even making sense of the words, so my sensation had nothing to do with legibility or the sentiments of the poem. It was the comforting familiarity of my mother’s handwriting that was emotionally affecting me. The looping, curling letters were so recognisably hers, were such an integral part of her, that I momentarily felt an overwhelming closeness to her. There was nothing religious about the experience. But it was unforgettable. I can only assume that, many years ago, my mother saw the poem in a book or magazine and liked it so much that she decided to make a copy of it. Without the aid of technology, she had no choice but to write it out by hand. Nowadays, no-one would take the time to do that. Even I, a calligrapher, will scan, photograph, or type a section of text that I want to duplicate for reference. All in the name of efficiency. Yet, if my mother had used a typewriter to make a copy of the poem, the resultant block of text would have been sterile, and would not have affected me in the way her handwriting did. So, I’m grateful that she wrote the poem by hand. And I’m pleased that, for whatever reason, she slipped it between the pages of her photograph album, unwittingly allowing me to discover that hidden treasure so many years later. Both Clare and I shared something very special because of simple handwriting, in that it brought us closer to our late parents. It would be a shame, then, if the doom-mongers are right, that handwriting will eventually become a forgotten skill. To prevent that possibility, we all need to write. If only to allow our children to feel a little closer to us in our absence, to remind them of the person we once were. Needless to say, it’s not the quality of our writing that’s important. We’re not attempting calligraphy. It’s simple handwriting. All we need to do is push the pen around awhile. Be ourselves. Just write. Ultimately, that’s all that matters.